Remember November 8, 2016? Ashley Novoa does, too — only instead of spending the next four years screaming into a pillow, she harnessed her fears / uncertainness / frustration and joined together with some moms she met on the Internet to create the Chicago Period Project! In the first year, Chicago Period Project has generated thousands of menstrual hygiene product donations, created and distributed hundreds of Period Kits, raised money for operating costs, and formed partnerships with local businesses. The Chicago Period Project empowers homeless and in-need people to experience their periods with dignity. The feminist, grassroots organization distributes pads, tampons, underwear, and other critical menstruation supplies to local shelters, schools, and crisis support networks. All menstruating people should have reliable access to period supplies. The Chicago Period Project’s goal is for the 29 percent of Chicago residents living below the poverty line to have healthy periods, and for us to raise awareness about this issue. Chicago Period Project is a community based organization whose mission is to help every menstruating person in Chicago experience their periods with dignity. We truly believe that there should be NO PERIOD LEFT BEHIND! Menstrual hygiene products for one year of periods cost roughly $1700, and our mission is to aid those living below the poverty line to afford the basic necessities needed to experience healthy periods. 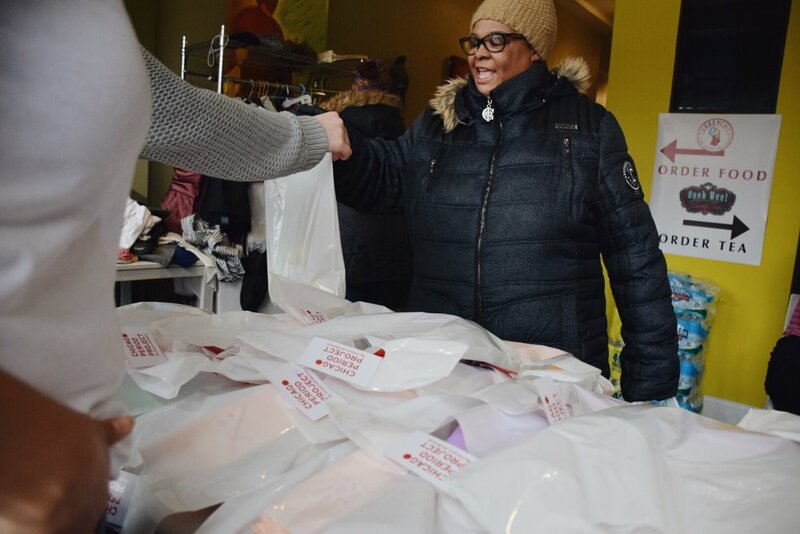 In partnership with other organizations and business that host donation drives, we are able to pass out period kits on the street or at soup kitchens, and donate menstrual supplies to various shelters throughout Chicago. Helped aid in Hurricane Relief efforts for Texas by providing donations to fill a semi.